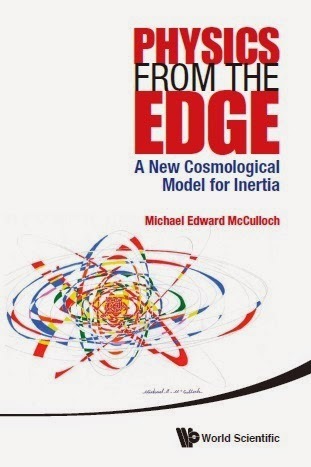 MiHsC (see an introduction) assumes that inertia is caused by a radiation pressure from Unruh radiation, and that the waves of this radiation are only allowed to exist if they have nodes at information horizons like the Rindler (local) or Hubble (cosmic) horizon, because if they didn't have nodes there, we could infer what lies behind the horizon and it wouldn't be a horizon (logic/information affects local physics). So far with MiHsC I've used an approximation, and assumed that as accelerations decrease, then the number of waves in the Unruh spectrum decreases linearly as they are disallowed by the horizon, and so the inertial mass decreases in a new way (predicting galaxy rotation without dark matter...etc). I can get away with this because the accelerations are rarely small enough that only one or two Unruh waves fit. As you can see, I've used the 2d (two-dimensional) version of spectrum-MiHsC to compare with the 2d one-wave MiHsC, for a fair comparison. I've shown the Cannae and Juan (2012) cases in red because I'm not confident I have the right geometry for them. MiHsC predicts that (usually) photons are more likely to see a resonating Unruh wave at the wide end, so the photons' inertia increases as they go towards the wide end and to conserve momentum the whole cone then has to move the other way. As you can see, the new formulation is much better for the NASA data but worse for the more powerful of the Shawyer experiments (I still don't know the uncertainties in the data). Interestingly, this approach predicts there can be a reverse mode for the emdrive (not a particularly bold prediction I admit since NASA may have seen a reverse already). MiHsC predicts this reverse occurs if you 'tune' the Unruh waves to fit better into the narrow end. I've been trying to develop a one-wave version of MiHsC for application to cosmology for ages, the emdrive is useful (if real) because it provides data on which to test progress. My earlier blogs on the Emdrive can be accessed here. is it really necessary to have your RSS feed post this article 10 times in one day to my inbox? Sorry about that. I do edit a lot after posting.. Towards the bottom of that page, 'Star Drive,' member of the Eagleworks team, posted a link to (yet another) theory on how the EM Drive works. Beyond me, but it may be superficially similar to your theory. At the bottom of that page, and continuing into the next, NSF member 'Mulletron' posts the initial results from his brand new frustum experiments. He does note...I'll call it 'significant technical issues,' though. Oh, and before I forget, 'Star Drive' also posts a fair number of plots for this device in the 'reverse' setting. About the reverse mode, it seems to allow a way to reverse by changing the frequency ? about the varying results of Yang Juand, Shawyer, with power, can it be such detuning ? overlapping of forward and backward thrust ? Tim: If you want my opinion of GEM, on first look, it's a over-labyrinthine 5-dimensional beastie, but the proof is in the comparison with data and GEM is far less successful than MiHsC. I've tried their Eq. 40 and GEM's predicted thrusts are ~100 times too small (0.2 microNewton/Watt) when compared with the data. I'm impressed with Mulletron's attitude,and a few others I'm in contact with, in setting up an experiment. Exactly the right thing to do. If I ever find a crazy engineer willing to help..
Alain: Indeed, MiHsC says that if the situation is arranged such that (unusually) more Unruh waves are allowed at the narrow end, then the thrust'll reverse. I'm writing a second MiHsC-emdrive paper on this. Did you mean the following? Yes, that's a typo. Thanks. Now corrected. It seems that MiHsC is a possible explanation for MOND. If your theory for EmDrive works, do you think it'll ignite a renewed look at MOND too? I'm thinking that it might also have some relevance to Dark Energy theory too. MiHsC predicts something very close to MoND. The difference is that MoND needs an adjustable parameter to be fitted by hand (a0), but MiHsC doesn't (it predicts the parameter itself). The predictions of the two do differ slightly. I had independently come to the conclusion that the Casimir Effect had something to do with these phenomena known as Dark Matter and Dark Energy too. Not being formally trained in theoretical physics (background is mechanical engineering), I didn't have enough of the math background, so I didn't know how to explain myself mathematically. Instead, had a lot of diagrams, and some curve-fit equations that I had tried. Reading the typical physics community papers, I got the feeling that no one else was thinking along these lines, until you. So thank you, the universe needs independent thinkers like you. So do you think your theory once it's fully formalized, be able to explain the gravitational lensing seen around galactic clusters, that seem to be used as the biggest proof for Dark Matter? As for Dark Energy, it seems you have an actual mechanism for why we see effect of Dark Energy. Do you see one day that Einstein's Cosmological Constant will be replaced by MiHsC, within the framework of General Relativity? The Cosmological Constant seems to be just a hand-inserted fudge factor, yours seems more formal. Another thing, you mentioned that MiHsC would somehow modify the speed of light assumption in Special Relativity. How does it do that? bbbl67: Yes, I think MiHsC will eventually explain lensing. The data from the emdrive has allowed me to make the leap of applying MiHsC to light. Einstein's cosmological constant was a arbitrary fudge that can now be explained properly by MiHsC. Regarding MiHsC and the speed of light: I'll need a whole blog entry to go into that. It raises many further questions, so I'd better write it carefully. Stay tuned. No, I didn't look at dark fluid, because it seemed to me, even from the title, to be the addition of another arbitrary and invisible object. When do you think you're going to present the MiHsC vs. Speed of Light assumption blog entry? As for Dark Fluid, the authors present it as an alternative to Dark Matter and Dark Energy, where they model the entire universe as a fluid dynamics system. bbbl67: Dark fluid needs several arbitrary parameters to work. These numbers have to be put into the theory by hand. I don't believe theories like that. MiHsC does the same job without any arbitrary parameters at all.